Uh…yeah. Listen, I know I can be a little ‘out there’ with some of the things I say, do, think, and write. I’m not normally one to hold my tongue when I’m in a group of folks I’m moderately comfortable with so I get that some one may come to view me in a certain light. The full list – as you can see, it’s not all about bringing one’s self to joy :-). Hmmmm, humans are funny, eh? Oh well. Enough of the procrastinating. Time to get back to my NaNo. Unless you want to chat about the weird ways folks have found your blog? Huh? Anyone? No? Dang it, back to writing then ;-). I’ve been there. Any time you mention anything that is the slightest bit sexual, you bring out that stuff. I’ve also tweaked the content to include the piece (of poetry) I talk about & if I have an upcoming show I make sure there’s a link to that there as well. Has anyone mentioned they came to a show based on what they read on your blog? Oh gosh, these are amusing! 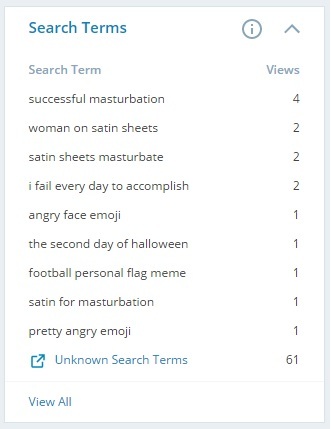 I’ve had some pretty hilarious search terms that led people to my blog too, many of which were also sexual or otherwise a bit odd. I always just laugh & wonder how in the world such things led to my blog.